Drip glazed incl bases. No Markings. Have had it confirmed that these are NOT Crown Lynn. The larger one on the left looks from the era of CL 'specials' (but clearly is not); the one on the right seems a little more recent, and looks to have been made in two halves then joined. Anyone out there ... ? got any suggestions ? Re: Drip glazed incl bases. No Markings. 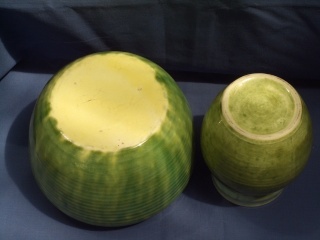 The mottled green larger piece reminds me of the glaze on the Timaru Potteries barrels. This was my first thought when I saw your photo. 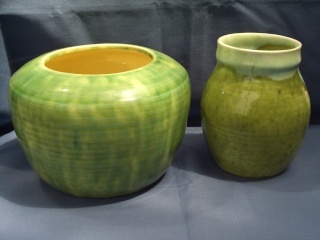 When I saw the one on the left ...my thoughts were the same as ev...looks similar to thos Timaru potteries barrels....? ?